My Wine of the Week this week is a really exciting red Grenache, or as it comes from Spain I should say Garnacha. Grenache is a Spanish grape and so should really have the Spanish name of Garnacha. I have come to Grenache relatively late, but am making up for it as I am now tasting many delicious and exciting examples. 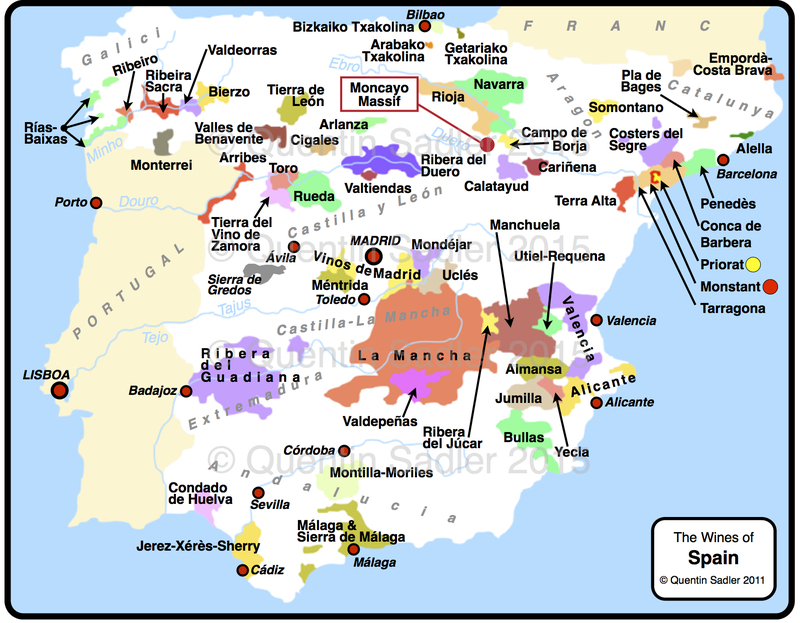 Of course the grape is largely responsible for the famous wines of Châteauneuf-du-Pape in France’s southern Rhône, but Spain makes a lot of very fine examples too. The most famous and widely praised must be from Priorat in Catalunya, but regular readers of these pages might be familiar with he sublime wines of Domaine Lupier in Navarra. Anyway I have recently tasted a Garnacha that is actually not produced in any recognised wine region, so it is simply labelled as a Vino de la Tierra, similar to Vin de Pays in France – my second Spanish Vino de la Tierra Wine of the Week in a row. Don’t let that lowly classification put you off though, the wine is superb. Map of Spain showing approximate position of the Moncayo Massif – click for a larger view. This wine is part of the Garnachas de España project which is attempting to reclaim garnet as Spain’s noble grape, to popularise it and to also bring Spain’s unused old Garnacha vines – the wild (salvaje) vineyards – back to productive life. Many vineyards were abandoned after phylloxera, some were considered too difficult to farm once tractors and other automative advances came in, in some cases families simply left the land and moved to the city. Whatever the reason, and there are many, old unused vines can be found all over most wine producing areas. This project is seeks to use this wonderful resource, just as Domaine Lupier did in Navarra. The vineyards are grown on the north facing slopes of the Moncayo massif which is located between the Zaragoza in Aragon and Soria in Castilla y León – it straddles the Castile/Aragon border. The vineyards are high on infertile rocky soils that contain a lot of slate. So conditions are relatively cool with big temperature drops between night and day, even at the height of summer. The grapes were handpicked and fermented in stainless steel tanks to retain freshness and fruit. The wine then ages in new French oak for 5 months, which smooths out the wine and softens the tannins. The colour is relatively light and a vibrant crushed raspberry and blackberry colour. The nose is dominated by the fruit, bright fresh raspberry and cherry notes together with a twist of orange and soft spices. The palate is soft and lively with lots of freshness and crunchy red fruit. The tannins are soft and smooth with just a gentle smear of chalkiness on the finish and there is a little touch of minerality too. This is a happy, happy wine, soft, joyous and utterly delicious – 88/100 points. Serve lightly chilled with almost any Mediterranean style food and you will have a very good time. I think it would be wonderful with Turkish lamb kebabs, it would even be nice to drink on its own. Available in the UK from £6.95 to £10.49 a bottle from The Wine Society and Majestic Wine Warehouse.